Israel's Menachem Begin, US' Jimmy Carter and Egypt's Anwar Sadat at Camp David. US govt. archives, Wikipedia Commons. The June 1967 war was a major watershed in Israel’s political history. The astounding military victory was a key factor in driving parts of the Arab world to confront the reality of Jewish statehood. The war’s territorial acquisitions, by contrast, are often seen as a mixed blessing. For although these gains gave birth to the land-for-peace formula (commonly associated with Security Council resolution 242 of November 1967), which led to the historic March 1979 Egyptian-Israeli peace treaty, Israel’s continued control of the Golan Heights and the West Bank has put it under persistent international pressure. The fiftieth anniversary of the war offers an auspicious vantage point for rethinking the pros and cons of retaining these territories. There is little doubt that the foremost gain attending Israel’s 1967 victory lies in the transformation of the international discourse about the country’s future borders, with the June 1967 line (or the Green Line) becoming the starting point for any such discussion. This represents a sea change for Israel, whose neighbors had previously refused to accept its very existence, let alone its initial borders. Israeli territorial acquisitions following the Six-Day War. Control of the Golan Heights, the Jordan Valley, and Sinai gave Israel far better military lines of defense than it had before 1967. 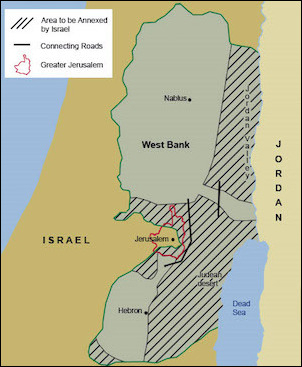 The highly restrictive borders delineated by the U.N. partition resolution of November 1947 have almost entirely dropped off the international agenda, their only residual remnant being the international refusal to recognize West Jerusalem (internationalized by the resolution along the city’s eastern part) as Israel’s capital. Also overlooked are the repeated Arab attempts to slash Israel’s pre-1967 territory, notably through the annexation by Egypt and Jordan of the Negev region, some 60 percent of Israel’s territory, an idea that received occasional favorable hearing in London and Washington. The massive political and diplomatic achievement by Israel notwithstanding, the war’s territorial acquisitions entailed a string of important military and strategic advantages. Control of the Golan Heights and the Jordan Valley, for one, gives Israel far better military lines of defense than it had before 1967. The current Golan border is the watershed line of the region, allowing the Israel Defense Forces (IDF) to hold the high ground with its clear defensive advantages. Nor is there any other line on the Golan to which Israel could withdraw while maintaining its topographical edge. The top of the cliffs that mark the western edge of the heights, sometimes mentioned as a possible line of withdrawal, would prevent the Syrians from having direct view into Israel, but it is no higher than the terrain to the east. In addition, the IDF’s presence on Mount Hermon enables the gathering of intelligence on goings-on in nearby Syrian areas and even further into the country. The claim that spy planes and satellites can replace the Hermon’s intelligence value is only partially true as these measures have limited intelligence-gathering capabilities compared to the unlimited capabilities of the Hermon station. Moreover, there are weapon systems for downing airplanes and destroying satellites while it is exceedingly difficult to down a mountain. The presence of Israeli military forces just 60 kilometers from Damascus also has a deterrent value as it is far easier to attack the Syrian capital from the Golan Heights than from the Green Line. Indeed, the IDF’s advance on Damascus in the October 1973 war was among the reasons why Syria agreed to end the war. Conversely, without Israel’s defense line on the Golan, the Syrians would have managed to invade its territory at the beginning of that war—for the first time since the 1948 war—with tragic consequences for the Jewish state. Instead, the security margins provided by the Golan allowed the IDF to contain the Syrian offensive, to regroup, and to move onto the counterattack. The demilitarization arrangements in the Sinai Peninsula, which served to stabilize Egyptian-Israeli strategic relations and paved the road to their historic peace treaty, are hardly applicable to the Golan given the marked size difference between the two arenas: a 200-kilometer-deep demilitarized zone in Sinai compared to the Golan’s maximum width of 24 kilometers. It is far harder to launch a surprise attack in Sinai than on the Golan. The security rationale for Israel’s continued control of the Jordan Valley is a similar case in point. Even a cursory glance at the map shows that there are very few approaches from the east (that is, from Jordan) to the West Bank’s hilly terrain, and from there, to the center of Israel. There is also a very large topographical difference between the Jordan Valley and Israel’s watershed line, which runs north-south through Jerusalem, some 20 kilometers from the valley. The Jordan Valley lies some 250-400 meters below sea level while the hilltops are some 700-800 meters above sea level—an elevation difference of at least 1,000 meters. In the event of an attack from the east, an armored column would need to make a steep 20-kilometer climb with only a handful of armored-accessible routes. As long as the defending forces can hold the entrances to these routes, any such invasion can readily be rebuffed. This was the strategic logic behind the Allon plan of the late 1960s, which also made eminent demographic sense given that the Jordan Valley is almost entirely empty of Palestinian population. Israel’s eastern border is its most important due to its proximity to the country’s main population centers. The aerial distance from the Jordan River to Jerusalem is 20 kilometers, and to Tel Aviv, 80 kilometers; the distance from the pre-1967 Green Line to the Mediterranean Sea is at its narrowest some 16 kilometers. The Tel Aviv-Jerusalem-Haifa triangle, containing most of Israel’s population and the bulk of its industrial and economic infrastructure, is very close to the Jordan River and a stone’s throw from the Green Line. This is a wholly different case from the borders with Egypt, Syria, and Lebanon, hence the eastern border’s great strategic importance, and hence the indispensability of an easily defensible border. The importance of keeping the border as far away as possible from the country’s heartland has become even more pronounced over the past two decades when the coastal plane’s economic and industrial centrality has steadily increased despite predictions of a more decentralized population due to developments in communication and transportation that brought the periphery closer to the center. The Allon Plan recommended partitioning the West Bank between Israel and Jordan as well as giving the Jewish state control of the strategically important Jordan Valley. Jordan’s King Hussein rejected the plan. No less important is the preservation of Israel’s control of the area known as Greater Jerusalem. As a quick glance at the map can easily reveal, Jerusalem, which is populated by a Jewish majority, marks the only intersection of the watershed line through which IDF forces can move from the center of the country to meet an invasion from Jordan. Of particular importance is the corridor from Jerusalem to Maale Adummim and down to the Jordan Valley. Hence it would be a grave strategic mistake to allow a foreign presence in Jerusalem that might threaten Israel’s control of its most valuable west-east route. Moreover, the Greater Jerusalem area is highly elevated, giving the IDF valuable intelligence gathering capabilities toward the east, south, and north. The historical, religious, and cultural importance of Jerusalem—the Temple Mount in particular—for the Jewish people goes without saying, yet lies beyond the scope of this article. It is clear, however, that territorial concessions in Jerusalem are likely to be viewed as a victory for Islam and to fuel extremist sentiments throughout the Muslim and Arab worlds. It is also true that Israeli control of the holy Jewish sites (and the holy Christian sites for that matter) guarantees free and uninterrupted access and freedom of worship—in stark contrast to the Palestinian attitude toward their religious minorities, let alone to Jewish holy sites under their control, such as the synagogue in Jericho or Joseph’s Tomb in Nablus. Israel’s military control of the West Bank also has an important role in fighting Palestinian terrorism. Regrettably, the Palestinian Authority (PA) has not only failed to meet its obligations to combat terrorism and to disarm all terror groups in the territories under its jurisdiction, as required by the Oslo accords of the 1990s, but has also abetted and actively perpetrated anti-Israel terrorism, especially during the Arafat years. The need for Israeli control was clearly demonstrated by Operation Defensive Shield of March-April 2002 and the subsequent Israeli recapture of some PA-held territory, which allowed the IDF to destroy terror infrastructures and to restore the intelligence capabilities vital for fighting terrorism. While Israel has withdrawn from most of these territories, the IDF continues to enjoy certain freedom of movement throughout the West Bank, entering many areas on a regular basis and, as a consequence, thwarting numerous terror attacks. In terms of counterterrorism, this is a major boon that prevents terrorists from blowing up themselves and Israeli citizens in Tel Aviv or Jerusalem; indeed, the past decade has seen a substantial reduction in the number of suicide bombings on Israeli soil. This reduction is largely due to Israel’s offensive activities, such as preemptive arrests and targeted killings, with the newly erected security fence playing a secondary role in curbing Palestinian terror attacks. The limited cooperation between the IDF and the PA security forces, developed after Arafat’s death in November 2004, hardly suffices to prevent terrorism from areas under the PA’s control. Quite the reverse in fact: Contrary to its “moderate” international image, the PA under Mahmoud Abbas remains as active a source of anti-Israel and anti-Jewish incitement as it was under Arafat, continuing to encourage terror, if with lesser intensity than before. In the absence of a reliable and peaceable Palestinian partner, there can be no breakthrough toward mutual reconciliation. Relinquishing military control of the West Bank in the absence of a peace-seeking Palestinian leadership is all the more dangerous given the massive difficulties in recapturing this territory in the not unlikely eventuality that the newly established Palestinian state would become a fully-fledged terrorist entity as has happened in Gaza following the Israeli withdrawal. It has, of course, been argued, notably by the late Shimon Peres, that territory has lost its importance in the age of missiles. This claim may have some merit but is historically shortsighted and strategically misconceived. Throughout history, generations of warfare have produced dramatic technological changes that resulted in equally dramatic vicissitudes in the fortunes of defensive or offensive postures. Thus, for example, the walls and castles of the medieval age improved defensive capabilities for some 500-600 years until the arrival of a new technology—the cannon—put an end to these measures and ushered in a new military reality. While missile attacks on population centers (in themselves an unequivocal war crime) are undeniably difficult to contend with, there has been immense investment in missile defense technology, some of which is already operational and effective, such as Israel’s Arrow and Iron Dome systems. 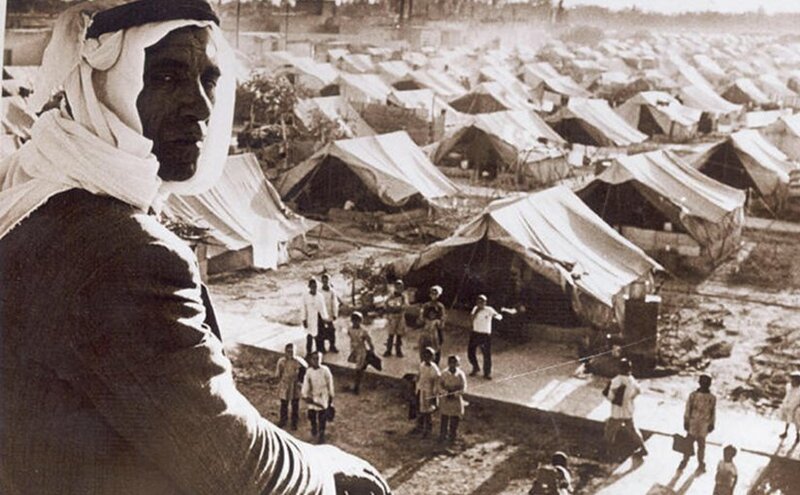 Nakba 1948 Palestine – Jaramana Refugee Camp, Damascus, Syria. Photo Credit: PD-Syria, Wikimedia Commons. Likewise, the conventional assumptions about the Arab world’s political realities and their implications for regional security hardly hold water. It has been claimed, for instance, that given the Jordanian regime’s historically less hostile attitude to Israel and its longstanding (albeit covert) objection to the creation of a Palestinian state, there is no need for Israel to retain control of the Jordan Valley. Yet, just as King Hussein jumped on the pan-Arab bandwagon shortly before the outbreak of the 1967 war—after Israel had saved his life on a number of occasions—so his son King Abdullah may well be tempted into a future adventure, however unlikely this may seem at the moment. Nor is it possible to predict with any certainty whether and for how long the Hashemite dynasty will be able to withstand the challenge of radical Islam or the creation of a Palestinian state, which may readily incite the kingdom’s marginalized Palestinian population against its monarchical rulers. The attempt by the Palestine Liberation Organization (PLO) to topple the Hashemite regime in the autumn of 1970 backfired in grand style. Given the substantial increase in Jordan’s Palestinian population since then, and with the aid and support of a fully-fledged Palestinian state, especially if ruled by the more militant and effective Hamas, they may well achieve this goal in the future, thus creating a vast Palestinian state on both sides of the Jordan River. Similarly, the expectations that a newly-established Palestinian state will meet its contractual peace obligations and refrain from siding with Israel’s enemies in future military confrontations, let alone refrain from wholesale anti-Israel terrorism, runs counter to the Palestinian modus operandi during the past twenty-four years, as well as their relentless commitment to Israel’s destruction in flagrant violation of their contractual obligations in the Oslo accords. Recurring suggestions for stationing international forces on the Golan Heights and in the Jordan Valley as a means to allay Israel’s security concerns are equally misconceived. As consistently shown on several past occasions, the presence of U.N. peacekeeping forces in Arab-Israeli conflict areas proved totally useless. In May 1967, these forces were instantaneously withdrawn from the Egyptian-Israeli border where they had served as a buffer between the two sides the moment President Nasser demanded their removal. Likewise, in September 2014, U.N. forces were evacuated from the Golan Heights as fighting in the Syrian civil war intensified. In Lebanon, the peacekeeping force deployed since the late 1970s (U.N. Interim Force in Lebanon) failed to prevent countless clashes between Israel and the PLO, then between Israel and Hezbollah. Nor did it manage to prevent the Islamist terror group from rebuilding its military infrastructure after the 2006 Israel-Hezbollah war as required by Security Council Resolution 1701 of August 11, 2006. The permanent deployment of U.S. peacekeeping forces offers no greater assurances. Washington quickly withdrew its forces from confrontation zones when the going got tough (Lebanon 1984, Somalia 1993, etc. ), and its recent unhappy experiences in Afghanistan and Iraq are hardly conducive to a future, long-term commitment of U.S. troops to one of the region’s longest running conflicts. No less importantly, a major part of Israel’s strategic value for the United States, and Western nations more generally, lies in its ability to defend itself on its own against any local (and at times external) enemies. This capability stands in marked contrast to the West’s Arab clients, which often needed large-scale foreign intervention on their behalf (Moscow’s 1970 intervention in the Egyptian-Israeli war of attrition and in the ongoing Syrian civil war; the U.S.-led liberation of Kuwait, etc.). Predicating a significant part of Israel’s security on international protection will largely erode this strategic edge. The above discussion underscores Israel’s dire need for secure borders, resistant to changes in military technology and regional political upheavals. A policy that fails to take into account worst-case scenarios would be highly irresponsible. As political scientist Yehezkel Dror often remarked, in the Middle East, there is a high probability for improbable scenarios. In these circumstances, Israel’s improved defensive, intelligence, and deterrent capabilities, thanks to its current borders, have a strong stabilizing effect on its relations with the neighboring Arab states by expanding its security margins and reducing its need for preventive or preemptive strikes, which entail domestic and foreign political costs. Continuing to hold on to the territories entails additional advantages. To begin with, it underscores Israel’s ability to resist persistent Arab and international pressure for withdrawal—a highly important demonstration of strength in a region where crude force constitutes the main instrument of political discourse, both domestically and externally, and where military might, in its different forms, is the most respected political currency. The fact that, despite recurrent international criticism and myriad anti-Israel U.N. resolutions, the Jewish state has managed to retain its control of the territories has also demonstrated its political and diplomatic stamina. The foremost supportive factor in this respect has been Washington’s continued support for the Israeli demand for an Arab attitudinal change before there can be any real progress toward peace. This support has been rendered all the more important over the past decades as the United States became the “only remaining superpower” following the Soviet Union’s collapse—a position it continues to hold despite the foreign policy setbacks of the Obama years. Above all, and contrary to the conventional mis-conception, Israel’s continued control of the territories offers the best, perhaps the only chance of Palestinian-Israeli peace. Given the categorical Arab rejection of the idea of Jewish statehood on the one hand, and the preeminence of physical force in Middle Eastern political culture on the other, Israel’s presence in the territories constitutes a permanent reminder of Arab impotence and the futility of sustaining the conflict. It was indeed the grudging realization that Israel would not be destroyed by force of arms that drove some of its Arab enemies to the negotiating table. 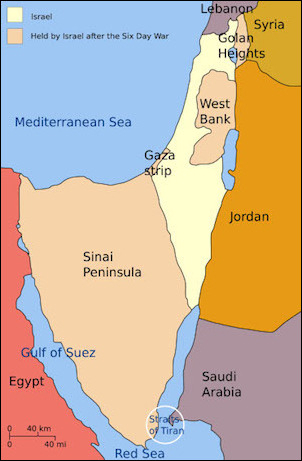 Egypt received the entire Sinai Peninsula only after concluding a fully-fledged peace treaty with Israel while the PLO was given control over the Gaza Strip and the vast majority of the West Bank’s Palestinian population (and some 40 percent of the area’s territory) after signing the Oslo accords, whereby it undertook to eschew violence, terrorism, and incitement. That the organization failed to abide by its contractual obligations, with Gaza becoming an unreconstructed terrorist entity under Hamas’s rule, affords further proof, if such were needed, of the West Bank’s critical importance for Israel’s future security. After the 1967 war, the international community seemed to accept Israel’s permanent retention of some of its territorial acquisitions as vividly illustrated by Security Council Resolution 242, which provided for the “[w]ithdrawal of Israel armed forces from territories occupied in the recent conflict.” The absence of the definite article “the” before “territories”—which, had it been included, would have required a complete Israeli withdrawal—was no accident but rather reflected an awareness of the existential threat posed by its pre-1967 boundaries. Indeed, the resolution envisaged this partial withdrawal to take place not as a unilateral move but as part of a comprehensive Arab-Israeli peace that would allow every state in the region “to live in peace within secure and recognized boundaries free from threats or acts of force.” And while the resolution’s intent has been misrepresented over the years by the Arabs and their international champions supposedly to demand Israel’s complete withdrawal from the territories, the notion that this will take place within the framework of a Palestinian-Israeli peace agreement has remained intact. There is no international demand (apart from those of the PA and its staunchest allies) for a unilateral withdrawal without a political quid pro quo and some security arrangements. Thus far, the cost of retaining the West Bank and the Golan Heights has not been particularly high. This should allow Israel to conduct negotiations over the future of these territories in a considered and patient fashion from a position of strength. For one thing, time clearly works in Israel’s favor: Since its establishment sixty-nine years ago, the Jewish state has steadily grown stronger and more advanced while its Arab adversaries have correspondingly become weaker. For another thing, the frenzied rush to far-reaching territorial concessions—by Ehud Barak in the Camp David and Taba summits (July 2000 and January 2001) and Ehud Olmert in the Annapolis conference (November 2007)—has proved highly counterproductive, further fueling Palestinian rejectionism and triggering the longest and bloodiest war of terror (euphemized as al-Aqsa Intifada) since the 1948 war. This, in turn, persuaded most Israelis that they had no real peace partner and that the establishment of a Palestinian state was a rather hypothetical possibility so long as no such partner existed. The future status of the Golan Heights, which Barak was equally keen to surrender, only to be flatly rebuffed by President Hafez Assad, has also been rendered largely irrelevant by the ongoing Syrian civil war. Indeed, as far as Syria is concerned, the cost of retaining the Golan has been strikingly low. Since 1974, Damascus has scrupulously observed the October 1973 ceasefire agreement and the border has been conspicuously quiet. This status quo suits Israel well, being strategically placed on the Golan, which unlike the West Bank is very sparsely populated (mostly by Druze, some of whom are Israeli citizens) hence poses no demographic problem. Furthermore, since the onset of the twenty-first century, Syria has been regionally and internationally isolated due to its intervention in Lebanon and special relationship with Tehran. As a result, its claim for the Golan has gone largely unheeded and its (however timid) hopes for retaking this territory by force have been dashed by the absence of a reliable war ally for this daunting undertaking. Apparently cognizant of its inability to occupy the Golan on its own, Damascus has concentrated on developing its defensive capabilities and expanding its long-range missiles arsenal, mainly designed to deter an Israeli aggression. Since 2011, Syria has been ravaged by civil war, whose end is nowhere in sight. Nor is it clear whether the country will be able to retain its unitary form or instead disintegrate along ethnic and confessional lines. Yet even if Damascus were to weather the storm, it has little to offer in exchange for a peace treaty with Israel. The key to Israel’s acceptance by the region is not to be found in Damascus: It is a historical process that has been in the making since Egypt signed the first disengagement agreement with Israel in the wake of the October 1973 war, subsequently expanding to Jordan, the Gulf states, and the Maghreb states. Syria has long since lost its veto power over other Arab states’ contacts with Israel. Moreover, it is unlikely to expect Damascus to cut ties with Tehran, its ally since the late 1970s and foremost savior of the Bashar al-Assad regime. Indeed, repeated U.S. efforts since the mid-1970s to extricate Syria from the radical camp have come to naught. It is also difficult to see Damascus severing relations with terror organizations, notably Hezbollah, which serves as an avenue of influence over Lebanon. At the end of the day, Lebanon is far more important to Syria than the Golan. In short, it seems that nothing that Syria can offer would outweigh the detrimental effects of relinquishing the Golan Heights as part of a peace treaty, especially since it has never been clear whether Syria is interested in peace as Israel understands it. Rather, it appears more interested in negotiations over a treaty with Israel with the process itself being more important than the outcome. Negotiations can protect Damascus from what it fears most: Israeli or U.S. aggression. The Turkish-Syrian context may be instructive. Ankara’s conflict with Damascus was similar to Israel’s, revolving as it did on disagreements over water, terrorism, and territory. Eventually, the Syrians decided at the end of the 1990s to acquiesce in Ankara’s water policy regarding the Euphrates, to stop supporting Kurdish terrorism against Turkey, and to drop their demands for the return of the Alexandretta district. Damascus’s acceptance of Ankara’s terms was above all a result of its marked military inferiority. Israel should similarly make the most of its superiority over Syria. In the West Bank, the situation is different, largely because of the demographic issue and its political implications. As noted above, the PLO/PA behavior since the conclusion of the Oslo accords inspires little confidence in its peaceable intentions. Hamas’s sweeping victory in the 2006 parliamentary elections, its violent takeover of the Gaza Strip a year later, and the growing influence in Palestinian society of other Islamist groups cast serious doubts about the Palestinians’ readiness in the foreseeable future to end their hundred-year conflict with the Zionist movement. By contrast, and given the broad unanimity in Israel about the necessity of separation from the Palestinian population of the West Bank and Gaza, Jerusalem should keep open the option for a territorial compromise that would allow the establishment of an independent Palestinian entity along the lines of the Allon plan. Of course, there is no certainty that such an entity will actually be established in view of the Palestinians’ massive state-building inadequacies over the past twenty-four years. They have most glaringly failed to meet the Weberian test of state building—maintaining state monopoly over the means of violence—by consciously enabling the existence of various armed militias that have spread widespread mayhem and chaos (or fawda, as they call it). If the Palestinians are politically incapable of engaging in state building, then it might be helpful to place them under the tutelage of the neighboring Arab states—Egypt in Gaza, Jordan in the West Bank. Of course, neither state is particularly keen on shouldering this daunting task; yet precisely for this reason, Israel should strive to ensure that the solution to the Palestinian problem is not placed solely at its doorstep. The time seems ripe for such a change. The ongoing Arab upheavals and the surge of jihadist Islam make the world far less captivated by the Palestinian illusion with many states prepared to consider alternative solutions to the problem. Even among the Arabs, there are growing voices that question the centrality of the Palestinian issue. In these circumstances, recurrent Israeli suggestions for unilateral withdrawal, born of the yearning for the resumption of the peace process, cannot be more misconceived. If the Gaza experience teaches anything, it is that a unilateral withdrawal without ironclad guarantees against the transformation of the evacuated territory into a terrorist hotbed is an assured recipe for disaster. In the absence of a worthy partner capable of effective control of the prospective Palestinian entity—and as long as Jordan or Egypt would not assume any role in managing Palestinian affairs—Israel will need to continue to deal with a weak and corrupt Palestinian Authority for some time to come. In this respect, it should be noted that even in the worst-case scenario that the PA would initiate another war of terror, its economic implications for Israel will be rather negligible. During the 1987-93 intifada and the “al-Aqsa Intifada,” only 5-10 percent of the national security budget was allocated to fighting terrorism. The use of infantry units, in contrast to naval and air formations, is relatively cheap. This is a “small war” of the type that requires limited investment of resources. Nor has the diplomatic cost of the two intifadas been particularly high. The negative views, in which Israel’s continued control of the West Bank are held throughout the international system, have had only peripheral effect, certainly as long as Washington is willing to accept the status quo. In the absence of a peace agreement, it is crucial for Israel to stick to its guns, so to speak. The military struggle against the Palestinians is bound to determine the country’s eastern border, which must run along the Jordan River. Moreover, the conflict with the Palestinians may also shape the future security arrangements in the West Bank in the event of a partial withdrawal from these areas. It would be a major mistake to view the “small war” with the Palestinians as unimportant or as a distraction from the IDF’s ability to concentrate on more dangerous scenarios. The IDF’s current tasks regarding the Palestinians are part and parcel of its overall duties, and it needs to develop the necessary organizational and conceptual flexibility for effectively coping with this challenge, which, in the final account, touches the core of Israel’s existential problems. to Jordan as part of a bilateral peace agreement, maintaining military control over the area west of the Jordan River is essential for its national security (and for Jordanian security for that matter). Unfortunately, there is no room for a territorial compromise on the Golan Heights. Losing this territory would entail grave security threats, and there is nothing Syria has to offer to compensate for this loss. *Efraim Inbar is a professor emeritus of political studies at Bar-Ilan University and founding director of its Begin-Sadat Center for Strategic Studies (1993-2016). Ilan Asia, Moked Hasichsuch. Hamaavak al Hanegev, 1947-1956 (Jerusalem: Yad Ben-Zvi and Ben-Gurion University, 1994). See, for example, Yigal Allon, “Israel: The Case for Defensible Borders,” Foreign Affairs, Oct. 1976, pp. 38-53. Hillel Frisch, “Motivation or Capabilities? Israeli Counterterrorism against Palestinian Suicide-bombings and Violence,” Journal of Strategic Studies, Oct. 2006, pp. 843-69. Author interview with Maj. Gen. Gershon Hacohen, Ramat Gan, Aug. 28, 2016. Mudar Zahran, “Jordan Is Palestinian,” Middle East Quarterly, Winter 2012, pp. 3-12. Efraim Karsh, “Why the Oslo Process Doomed Peace,” Middle East Quarterly, Fall 2016. “Resolution 242 (1967) of 22 November 1967,” S/RES/242 (1967), U.N. Security Council, New York, art. 1(i), (ii). Efraim Inbar, “Time Favors Israel. The Resilient Jewish State,” Middle East Quarterly, Fall 2013, pp. 3-13. Daniel Pipes, “Assad Isn’t Interested,” DanielPipes.org, Aug. 29, 1999. See, for example, Barney Breen-Portnoy, “Saudi Journalist to Palestinians: Armed Resistance to Israel Is Futile, Arab World Has Lost Interest in Your Cause,” The Algemeiner (Brooklyn), Jan. 27, 2017. Efraim Inbar, “Israel’s Small War: The Military Response to the Intifada,” Armed Forces & Society, Fall 1991, p. 37. Efraim Karsh, “Palestinian Leaders Don’t Want an Independent State,” Middle East Quarterly, Summer 2014.